Water and wastewater systems play an important role in sustainability for several reasons. First, energy is used to convey, pump, distribute, treat and heat water, so saving water saves energy. Second, experts agree that the effects of climate change will further reduce the availability of water. Therefore, efforts to conserve water will play an important role saving energy, reducing greenhouse gas emissions and securing water resources for the future. The best practices included in this section apply to cities and counties that provide water and waste water services directly, as well as to those that receive these services from other public or private agencies. Learn more about best practice options to consider when addressing water and wastewater at the local level. Cities and counties are leading by example and undertaking a range of activities to create more sustainable communities. These case stories review different local agencies’ experiences related to water and wastewater systems activities. These resources will help inform your water and wastewater systems activities. Resources include links to organizations, state and federal agencies, tools, guides and tip sheets to support your work. You’ll also find examples of programs and materials from cities and counties. 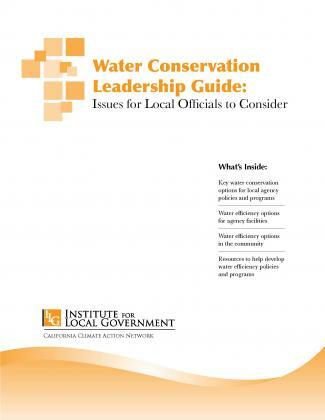 Provides water conservation options and resources for local officials.